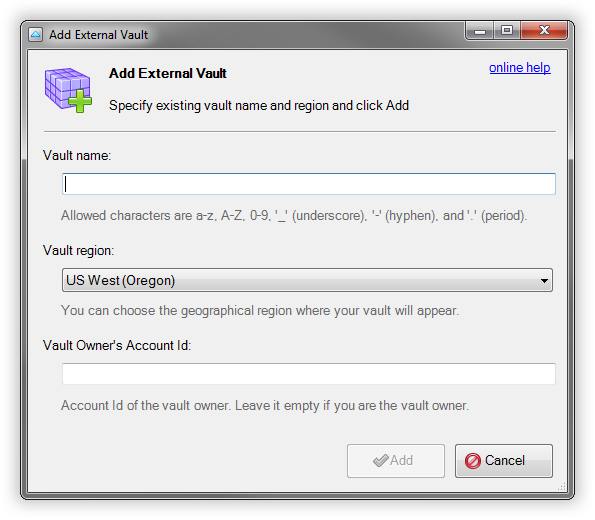 How to share Amazon Glacier Vault with another AWS User. 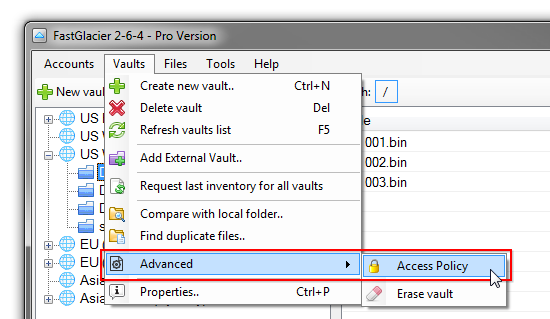 Share the vault using Vault Access Policy. 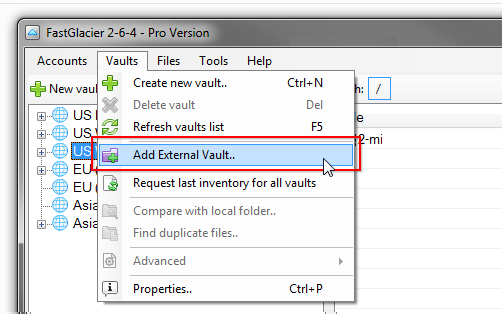 How to grant access to your vault to another user. Share the Vault using Vault Access Policy. Grant access to your vault to another AWS user. 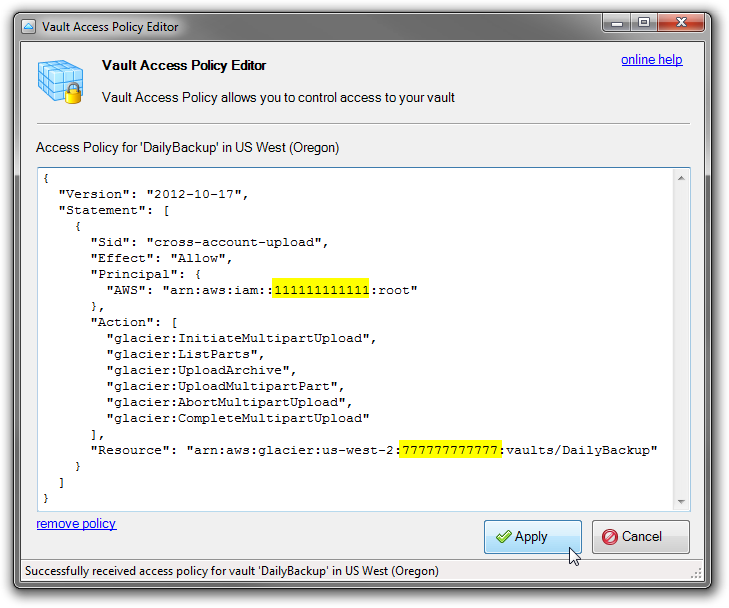 Recently Amazon Glacier Team announced the new featue called Glacier Vault Access Policies. Using Access Policies you can easily share your vault(s) with other AWS users. From the tutorial below you will learn on how to grant access to your vault to another AWS user and how to connect to the vault shared with you by another user. Prerequisites: in order to grant access to your vault to another user you need to know their Account Id. The users may find their Account Id in Account Settings. 1. Start FastGlacier and navigate to the vault you want to share. Where 111111111111 is the Account Id of the user you want to share the vault with. 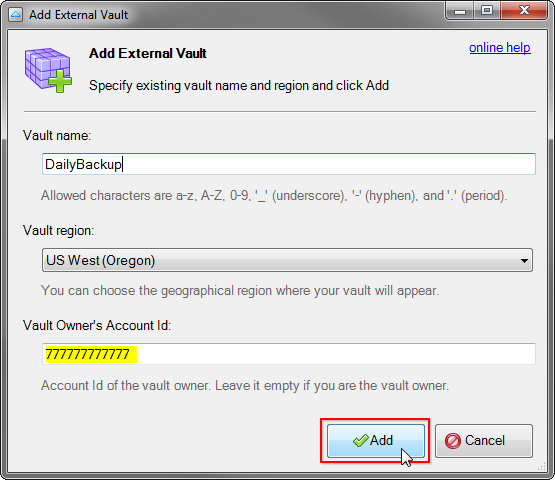 And arn:aws:glacier:us-west-2:777777777777:vaults/DailyBackup is the ARN of the Vault you want to share. The policy above allows the user with Account Id 111111111111 to upload files into the vault DailyBackup located in US West (Oregon) region. For full list of allowed actions and policy examples please check AWS Documentation. 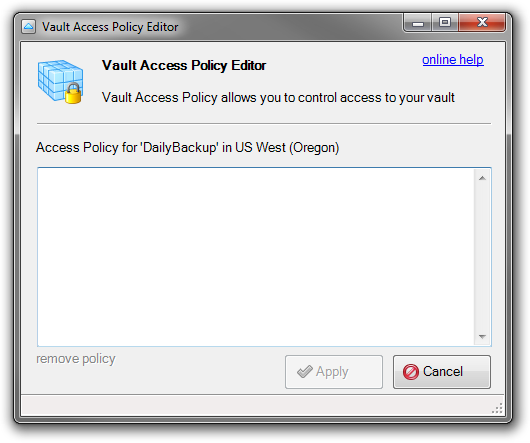 If you paste the policy into the Policy Editor, the Vault Arn is updated automatically. The user may follow instructions below to access the vault (permanent link). Now you can work with the vault according to the permissions provided. Vault Access Policy Editor - working with Vault Access Policy.